While an apple a day is known for keeping the doctor away, researchers suggest going to work on an egg everyday could be the best way to start the day. For, they say, it can also keep unwanted intake of calories at bay. According to a Surrey University study, the first of its kind in Britain, eating eggs for breakfast can help slash the calories eaten at lunch and dinner. They keep us fuller for longer compared with other common breakfast foods. The researchers suggest, eggs are also better for people who want to resist afternoon snacks on biscuits, cake or chocolate. The study tested three typical breakfasts with the same level of calories - eggs on toast, cornflakes with milk and toast, or a croissant and orange juice. Adding to the growing body of evidence to support eggs as a key ingredient of weight-loss diets, the Surrey team found volunteers felt fuller for longer and had a lower desire to eat after the egg breakfast compared with the other ones. 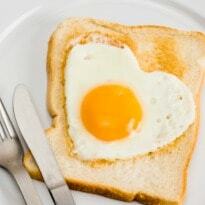 Comments	The egg breakfast also led to a significantly lower intake of energy at lunch and evening meals compared with the other common breakfasts.